Bonne -L'Isle de Terre-Neuve, L'Acadie, ou La Nouvelle Ecosse,. . .
Bonne, R. - L'Isle de Terre-Neuve, L'Acadie, ou La Nouvelle Ecosse,. . .
L'Isle de Terre-Neuve, L'Acadie, ou La Nouvelle Ecosse,. . . - Bonne, R.
Title : L'Isle de Terre-Neuve, L'Acadie, ou La Nouvelle Ecosse,. . .. Size : 8.1 x 12.4 inches. / 20.7 x 31.5 cm. 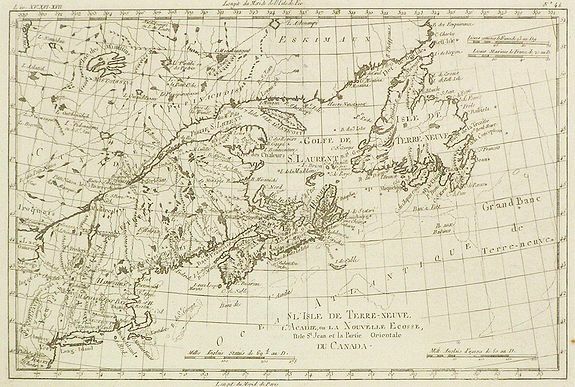 Description :Elegant small map Eastern Canada, also showing parts of the northeastern United States. Excellent detail of coastlines, small lakes and rivers throughout the region. Drawn prior to the Revolution, the colonial boundaries are shown expansively, with New England stretching well into present day Canada. Like his predecessor J.N. Bellin, Bonne was a prolific hydrographer working in the French Dépot des Cartes et Plans de la Marine. Condition : A few small spots.